was born in Port Angeles in 1959. He performs regularly with La Banda Gozona, Northstar Saxophone Quartet, and a number of orchestras and chamber ensembles in the greater Seattle area. 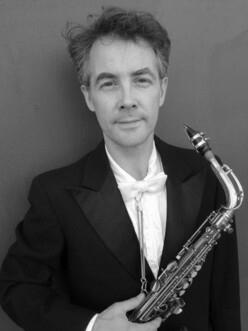 Scott has performed as soloist with Brass Dragon Saxophone Band, Cascade Symphony, Foss High School Concert Band, Philharmonia NW, Puget Sound Music Society Concert Band, Volunteer Park Conservatory Orchestra and Washington Wind Symphony. Past musical projects include several Vodvil Theater productions, FR3D (an “art-rock” ens. ), Anti-Fascist Marching Band, Raging Maggots and many works with various dance troupes. He can be heard on recordings with Black Cat Orchestra, David Byrne, Land and Soundgarden. His performances have included most sizes of the saxophone, tiny sopranino to the mighty basso. Scott has studied with saxophonists Patrick Meighan, John Moore, Lee Patrick and Sigurd Raschèr at their respective summer workshops, with Michael Brockman at the University of Washington and with Gary Edighoffer at Spokane Falls Community College. One workshop at Yale University featured a saxophone orchestra 56 members strong. Mr. Granlund owns and operates Granlund Woodwind Repair in the Belltown neighborhood of Seattle. Scott plays older saxophones built at a time when musical instrument manufactures prided themselves in building a “modern” saxophone while still complying with the original acoustic specifications and mouthpiece design of the instruments inventor, Adolphe Sax. Black Cat Orchestra, "Black Cat Orchestra"
Black Cat Orchestra, "Mysteries Explained"
Black Cat Orchestra, "Long Shadows at Noon"
CD - Luaka Bop/Warner Bros.
Soundgarden, "Room a Thousand Years Wide"
political tunes 1986 - 93 etc. Run Remain's "the Sherman Preludes"
Shoreline Community College Opera Dept. University of Washington Opera Dept.